What you are about to discover in this site is amazing evidence that we in 2017, are living right in the end of times for this world as we know it. The prophecy of Daniel 2 alone shows we are in the 'time of the end', and all the other evidence proves we are in the very end times. The Biblical signs are clear for all to see, and after reading through this site with open eyes, even the scoffers will struggle to argue against it. Sure, many people throughout history have been proclaiming that they were living in the last days and the end of the world was nigh, and some of the Bible signs have always existed from the early days. But never has there been a time before when ALL these events were evident in so many diverse places and with such frequency and intensity. Our Generation is the FIRST generation to fulfill ALL the biblical signs. So we will show you from the many following signs on this and other pages, that without doubt we are living in the final years that the Bible prophesied were to come. If you take into consideration all the signs, there is no mistaking that our generation is living in the last days, nearing the second coming of Jesus. Problem is, Satan can see how close we are to the end of the world, which is why he brings certain 'end times groups' into the spotlight, proclaiming false dates for the second coming, which when those dates come and go, causes many people to turn away completely from the truth. The truth being that WE ARE living in the end times. The Bible is very clear on that. We just can't set specific dates for Jesus' return. But we CAN know when the end is near ... And we are certainly now seeing "ALL these things". Before you read on, please note this important point. In Matthew 24, Jesus speaks of wars, earthquakes and such things, but says these are just the "beginning of sorrows" and "the end is not yet". Now that word "sorrows" in the original language meant "birth pangs", the pain in childbirth. Now birth pangs speak of frequency and intensity. And as a woman gets nearer the birth, the "pangs" become more frequent and intense. This is true also for the signs of the end times. ​These signs began not long after Jesus' day, and as Jesus quoted, the end would not yet be, because this was just the beginning of sorrows. But throughout history we have seen the "pangs" (signs) become more frequent and intense, culminating in the day we live in now where the pangs are so frequent and intense that we must be right at the time of "delivery", when Jesus is to return. So don't let anyone fool you into believing that the signs today are just the beginning of sorrows and the end is not yet. "The beginning of sorrows" started nearly 2000 years ago with the persecution of the early church and the destruction of Jerusalem. We are living right at the end of time. More than being a "sign" of the times, this is an historical FACT of where we stand in earth's history. The vision that God gave King Nebuchadnezzar as shown in the Bible verses above, and subsequently the interpretation to the prophet Daniel, consisted of an image of a man which depicted all the "ages" and ruling kingdoms from the time of Babylon until the second coming of Christ Jesus (the destroying Rock, which is the eternal kingdom of God). As you can see from the picture, the different parts of the man represented the different "ages" and ruling kingdoms of this world. And what is the last "age"? It's the feet of the image. And when did the last age start? It started in the year 476 AD. when Rome fell and split into the ten kingdoms of Europe. ​Which means this world has been in the "last age" for over 1500 YEARS! So add that to the amazing signs of the last days that you will see throughout this site, and you are left with no doubt that we are living right at the end of the toes on the image and right at the end of time, soon to see the second coming of Christ Jesus. I Just love this sign, because it is clearly pointing to our day today, and it cannot be refuted by anyone. Throughout history we have had a slow and little increase in knowledge. But take a look at the EXPLOSION of knowledge over the past 150 years! Up until recently in history, the fastest form of transport was a horse. Now man can travel at hundreds of miles per hour, and cross the globe in a day! Technology has developed at a rapid pace, which has led to great improvements in computer power, scientific discoveries and the medical profession. ​Just look at how much we have learned about the human body with things like DNA and Cellular Structures etc. And how about "running to and fro"? This is pointing specifically to our day with planes, trains, automobiles and the busyness of modern day life. We are definately running to and fro and have knowledge like no time before us. This Bible sign has a dual application. "running to and fro and knowledge increase" also applies to knowledge of Biblical truths (see Amos 8:12). During the "dark ages", for over 1000 years, knowledge of Biblical truths were surpressed by the Roman Catholic Church. But since the protestant reformation and breakaway from Rome, God's people have been running to and fro in His Word FREELY and knowledge about great Bible truths have been revealed. God now has an end time remnant church with the FULL gospel truth to take to the world before the end comes, which was needed to fulfill the sign about taking the true gospel message to the whole world. Which you will read about further down the page. Now this is a sign that most people miss! Have a think about it ... What needs to happen in order for the "beast system" to stop people from buying and selling if they refuse the mark? We need to have a worldwide financial system whereby everything bought and sold is through electronic means, not cash. Has there been any time in history where this could happen? No. Are WE living in a day where this could happen? Most certainly, yes! And the powers of this world are now trying to make cash obsolete, and are actively pushing pure electronic forms of payment, like "PayPal" and "Google Wallet" for instance. Take a look at the news and you will see this being reported in different countries of the world. ​Above is just a few examples of the major push throughout the world for a cashless society. We have the techonology to do this now, which in times past wasn't possible. And look at the financial turmoil around the world today. This will help in bringing in a "unified" currency to help make it possible to enforce the mark of the beast. Technology isn't the mark, but technology is needed for proper enforcement of it. This is a SURE sign of the end times! Paul here is saying that "THAT DAY", the second coming of Christ, will not come until the falling away happens and that man of sin is revealed. Now many professed Christians today believe that the 'falling away' is something that will happen in the last days. But this is a wrong view, because the falling away began not long after the New Testament church and was completely fulfilled when the Roman Catholic Church took control and merged Christianity with Paganism, and punished anyone who did not bow to her so called 'authority' and false teachings. ​And that man of sin who was "revealed" to the world during the Protestant reformation is none other than the pope(s) of the Roman Catholic Church. See proof of who the man of sin is HERE. What was it like in Noah's day and Lot's day? We need to go to two other Bible verses to see what it was like. Genesis 6:13 tells us that in Noah's day the "earth was filled with violence." And in Jude 1:7 it says that in Lot's day, Sodom and Gomorrha had given itself over to "fornication and strange flesh". So violence prevailed in Noah's day and sexual immorality (including homosexuality) prevailed in Lot's day. And this would be a sign of the end times before Christ Jesus returns. So our question is, does violence and sexual immorality (including homosexuality) prevail in the world today? Very much so, yes! Not only does violence and fornication rage across the whole world, homosexuality has become a "norm". Since 2001, at least 14 countries have fully legalized homosexual marriage, Argentina, Belgium, Canada, Denmark, Iceland, Netherlands, Norway, Portugal, Spain, South Africa, Sweden, New Zealand, Uraguay, France, with some parts of Mexico and America doing the same. And there are more countries being added to this list all the time. How about a rise in spiritualism and the occult in the world? Have we seen this? Well, just look at the television and movies today. "Twilight", "Harry Potter", "Lord of the Rings", and a whole host of other television series and movies containing the occult and spiritualism. It has invaded our lives like no other time before us. And what is the cause of this? It is the false teaching of the immortality of the 'soul'. Spiritualism is also the cause of these 'near death experiences' which Satan is deceiving more and more people with. Many people don't realize that spiritualism has also invaded the majority of churches around the world, due to this false teaching of the immortality of the soul. Yet the Bible clearly teaches that "the dead know NOTHING" (Ecclesiastes 9:5), and that when we die we return to the dust of the ground from where we came (Genesis 3:19). But the churches have embraced this false teaching of the immortal soul, which is another sign of the times we live in. So what about this Biblical sign? Is this being fulfilled in our day more than any other day before us? Most definately. Just look at all the natural disasters we are getting now every year. Are the "seas and waves roaring"? Yes. Tens and even hundreds of thousands of people are being wiped out from Tsunamis and floods, and men's hearts are certainly fearing what is happening to this world. In America in 2010, a record was set for the number of Federal Disaster Declarations given over a year. That number was 81. In 2011, that number was broken again, with 99 Disaster Declarations given, costing over 32 Billion Dollars. 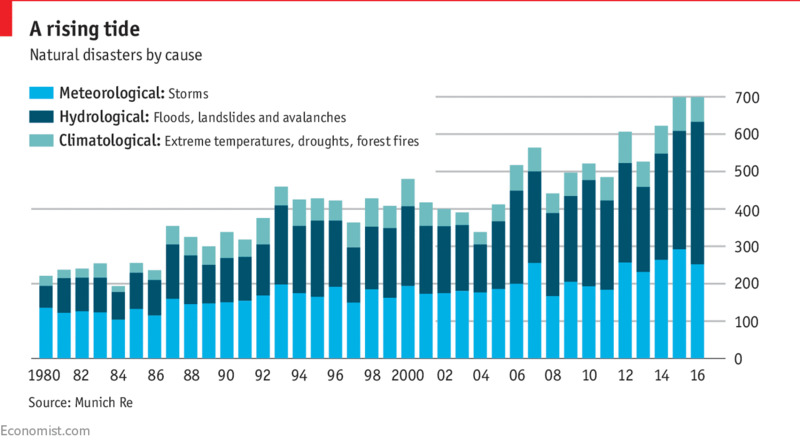 And 2012 produced another year of record breaking disasters. ​Dr. Robert Hartwig states ... "The number of U.S. disaster declarations has been trending sharply upward, particularly over the past 15 years." (Source) ... We are really seeing things happening in this world now with regards to the fulfillment of Bible prophecy today. Click on the following charts. The scoffers love to bash this one, but from the evidence available, it is clear that earthquakes are not only increasing in frequency, but also appearing in more and more "diverse places", which the Bible predicted. We had a 'millenium's worth' of earthquakes in just 2 years, during 2014 and 2015 (source). A global SURGE in great earthquakes between 2004 - 2014. (source). God is giving us plenty of warning through these events, and we will be without excuse if that day of Christ's return comes upon us like a thief in the night and catches us unaware. We need to heed the signs and get ready! Please see these amazing videos showing a graphical look into the earthquakes around the world. Christ said that there would be earthquakes in "diverse" places, and these amazing videos certainly fulfills that prophecy. This sign carries on from the "increase in knowledge" sign above. But I wanted to separate it to show you that this sign alone reveals we are living in the last days. God tells Daniel to seal the book. In other words, to seal the prophecies contained within it. And that at the "time of the end", the prophecies would be unsealed and we would know what they mean. So this alone confirms that we are living in the end times. But taking all the other signs together will show us how close we are to the second coming of Christ Jesus, the Son of the living God, and the end of the world. We've certainly had our fair share of false Christ's appearing around the world. Also, today we have many false religions proclaiming many ways to eternal life, like Roman Catholicism, Islam, Hinduism, Buddhism, Sikhism, Folk Religions, Wicca, and many other 'new age' movements. With false prophets like the Pope, Muhammad, Krishna, Buddha, etc., leading these religions. We also have many false prophets and leaders in "Christian" churches, like the the prosperity gospel preachers and people like Oprah Winfrey leading these new age movements. And millions of people have been sucked in and deceived by these 'false prophets'. There are also many who appear to be 'sheep leading the flock' but in fact are 'inwardly ravening wolves' leading the people to destruction. People like Rick Warren who preach just enough truth to lull the unlearned mind into following them into apostasy! Yes, this sign has certainly been fulfilled. Is this sign being fulfilled in our day? Yes. There is an ecumenical movement today which we were told about in end times prophecy that is uniting the world in an effort to bring peace. Churches and faiths and political leaders are uniting like never before in an effort to bring peace to this world. But this ecumenical movement is not of God, because we as God's people are not to unite with the world or any false religion (Amos 3:3, 2 Corinthians 6:17, Revelation 18:4). When they do declare "peace and safety" then destruction will come upon them (1 Thessalonians 5:3). Many people say that this isn't a sign of the end times, because there have been wars since the beginning. Yes there have been wars since the beginning, but when you look at the frequency and intensity of wars, then it's plain to see that this is a sign of the times we are living in. During the 20th century alone, more people have been killed as a result of war than all previous centuries combined. This has resulted in HUNDREDS OF MILLIONS of people being killed in wars like World War I, World War II, Russian Civil War, Congo War, Korean War, Vietnam War, Iraq, etc. Today, there are conflicts and wars raging all around the world (Source). And in 2011, armed conflicts greatly increased according to this report. So is war a sign for today? Of course is it. But remember, we are not to take any of these signs ON THEIR OWN. Jesus said ... "when ye shall see all these things, know that it is near". (Matthew 24:33). Taking one sign like this on it's own will not prove we are living in the last days. All signs need to be fulfilled. Just look at the famine that has struck the world over the past 30 years. Thousands die everyday of starvation and according tothis news article global starvation is spreading and increasing causing 1 Billion people to go hungry around the world. Add to that the failed crops throughout the world because of extreme weather, and bees dying off in massive numbers, and we have a worldwide shortage of food on it's way. The sad thing about this sign, is that the amount of food that is wasted in the developed world could feed the hungry! So think about those in need next time you are about to fill up your shopping trolley with food that will be wasted. The Bible teaches us that we need to be helping the poor and needy, by giving them of our bread and clothing. Rather than throwing away what we don't want or need. Christians were being killed for their faith in the first century, as well as during the dark ages when the Roman Catholic Church ruled the world and killed tens of millions of God's people. This is being repeated today in places like the Middle East, China, North Korea, Pakistan, India, Nigeria, Egypt, where many Christians are being killed for their faith in Christ Jesus everyday. And once the mark of the beast is enforced soon, then this persecution will spread to the Western World. Idolatry, Adultery, Violence, Lust, Greed, Disrespect, Homosexuality, Theft, Lying, Aggression, Selfishness. Is this Biblical sign fulfilled in our day? Absolutely! Just go back 50 years and you would not see half the sin and wickedness that we see in people today. Look at what is portrayed on our TV screens and in the movies and video games! Violence, lust and all manner of evil. This is one of the major end of time signs. Our world today is aching under the burden of sin and I'm sure God will not allow it to continue for much longer. And do you know the worst thing about "sin" today? It is made into "ENTERTAINMENT"! Through movies, television programs, radio, magazines, comics, you name it! The majority of people in this world today, including professed Christians are happily entertained by the very thing that put the Son of God on the cross! What an abomination! And please note, I am not just talking about the sins of non Christians. A sure sign that we are living in the end times is the fact that the Christian churches are full of unconverted, sin loving people! Many of them thinking they don't need to keep the ten commandments, and can continue living in sin, as long as they "believe" in Jesus and go to church once a week. Yes, iniquity has abounded! This sign of the times has certainly been fulfilled in our generation. A great majority of professing Christians these days do not study the Bible much. Instead they just rely on their pastor's word as the truth. Let me give you an example. Back during the Protestant reformation, where many people died standing up for the truth of God's Word. God revealed a great truth to the world about who the antichrist was. All of the reformers knew the truth about the Roman Catholic Church being the Bible antichrist. But as time has gone on and false teachers have crept into the churches, the majority of Protestants now reject this great truth that God opened up to the early Protestant leaders, and they now EMBRACE that antichrist church and have become a part of Babylon! The above end time sign from Timothy also says that they would be turned unto fables. Let me give you a few fables that the majority of Christians have been turned to. 1. The rapture. 2. Looking to Israel for fulfillment of end times prophecy. 3. Mark of the beast being a microchip. 4. The Battle of Armageddon being a physical battle. And there are many more. Just recently, it was revealed that Russia had dumped enormous amounts of radioactive material into the ocean, including 17,000 containers of radioactive waste, 19 ships containing radioactive waste, 14 nuclear reactors, including five that still contain spent nuclear fuel; 735 other pieces of radioactively contaminated heavy machinery, and the K-27 nuclear submarine with its two reactors loaded with nuclear fuel (Link). The rivers and seas are becoming completely polluted, and man is certainly destroying the earth like no other time in history, and God's wrath is about to fall upon them! We have been living in the time of judgment since 1844 and once the judgment has ended, THEN Christ Jesus will return to "reward" the saints and "destroy those who destroy the earth". Notice Jesus said "THIS" gospel? There are many "gospels" being preached out there, but it is the TRUE GOSPEL that is to be preached to the world before the end can come. So is this being fulfilled today as one of the end time signs? Yes, because God's people are preaching the true gospel throughout the world like never before, through the internet, tv and satellite, radio, in the pulpit, and through print. We have never had the resources available before to reach the world the way we can now. This ministry alone receives thousands of visits everyday from people from all over the world seeking the truth. So yes, this Bible sign is BEING fulfilled now. What end time message is God's true servants taking to the world today? And what do we have now for "rapid transit" of the gospel message around the world? The internet and satellite! We are living in a time like no other and the gospel message is soon to reach the final corners of the earth, and THEN the final stages of this earth's history will take place. But what about all the different languages you may say? Well, ministries like Faith Comes by Hearing provides a free audio app that shares the Bible in 883 languages! And that number is growing all the time. So yes, the languages of the world are being reached with the Word of God.